Finally someone combined the zombie movie with that of the high school prom flick. A bunch of school kids get tangled in a night of mayhem as the dead rise to munch on the living! One of our young heroes has a fallout with his girl and she heads to the dance without him. When the zombie infestation starts to spread across town, the race is on to get to the dance to save her. The science club nerds and a rock band are also part of the madness. 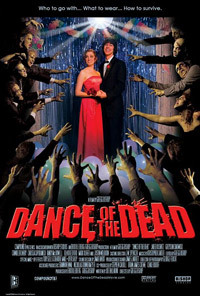 With a cool spin on the genre with an expected healthy dose of humour injected, Dance Of The Dead plays like the first two Return Of The Living Dead movies, and with good production values, there's little to fault here. Perfect for a night of laughs & gore.